According to World Meteorological Organization research, 2017 was one of the three years with the highest yearly average temperature since meteorological records began. Average temperature has already risen by 1.1℃ when compared with before the Industrial Revolution, and atmospheric carbon dioxide levels continue to rise. When the World Economic Forum published their report on global rise in January 2018, three of the top five risks were related to the environment, namely extreme weather, natural disasters, and failures to respond to climate change. Extreme weather has been listed as the number one risk for two consecutive years. Such research and investigations have shown that the internal and external impacts on business that climate change creates cannot be ignored. The internationally signed Paris Agreement came into effect in November 2016, with signatory nations laying out progressive goals. As a global corporate citizen and leading ICT industry brand, Acer supports this agreement’s goals of keeping global temperature increase within 2℃ of the temperature before the Industrial Revolution, and within 1.5℃ if possible. As such, both in the nations in which we operate and in our supply chain, we have actively implemented a plan oriented toward meeting Nationally Determined Contributions. Through our Working Group on Risk Management, we continue to consider the potential impacts of climate change, forecasting the probability and potential impact of these risks, drafting contingencies and risk mitigation measures, and developing crisis management and early warning mechanisms to mitigate the effects of risks on operations. Regarding major climate risks, we anticipate that natural disasters, as well as regulations and consumer preferences for energy efficiency and product labeling in various countries, will have a more significant impact than in the past. With regard to these risks, we are analyzing and developing countermeasures for the various factors according to their probability of occurrence and their potential impact, and we anticipate seeing a reduction in the impact of climate change risks. With regard to climate-change-derived opportunities, we not only continue to pursue improvements to product energy efficiency but also strive to integrate existing and new business groups to create a unified low carbon, sustainable“Smart Strategy.” In addition, in our primary operating locations such as Aspire Park, we have set up solar power generation stations, along with formally establishing a “smart transportation” subsidiary. This will enable us to make the most of the expertise of the ICT industry to help society and all departments of the Company reduce carbon emissions and make appropriate adjustments. In addition, through internal assessments and situational analysis, we are able to relatively limit the financial impact of changes in physical infrastructure, policies, regulations, and markets brought about by climate change. We also create related business opportunities through innovation and product development. 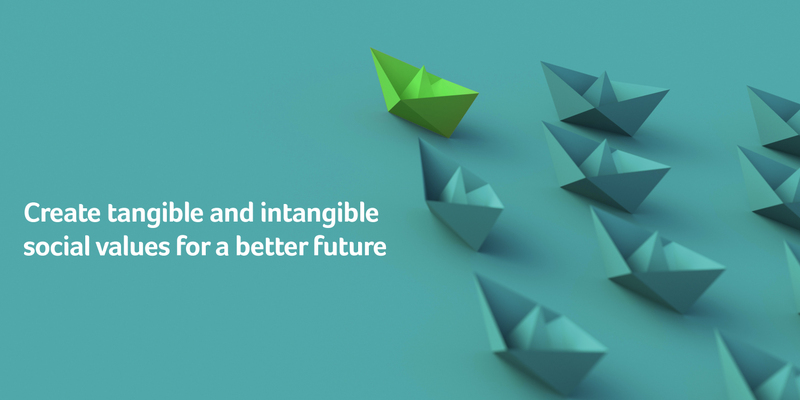 Through the continual strengthening of our capabilities through projects like a smart parking system, improvements to energy efficiency in our IT products, and development of renewable energy resources, we expect to be in even better control of our circumstances into the future. Since 2011, Acer has contracted a third-party verification agency with both CDP and Taiwan EPA accreditation to undertake GHG Protocol Scope 1, 2, and 3 inspections of the emissions produced by staff business flights. Through this, we found that the Acer Group was responsible for 18,844.380 tons. Of Scope 1 and Scope 2 carbon emissions in 2017, with Scope 1 emissions primarily from North American and European natural gas usage and global combustion activity. Scope 2 electricity usage down to approximately 70%, primarily due to increased usage of green electricity. Total emissions in 2017 were reduced by approximately 56.05% compared with the baseline year. Per capita emissions were approximately 2.412 tons. In addition, in accordance with GHG Protocol Scope 3 principles, we inspect the emissions produced by staff business flights, product and service purchases, product shipping, and leased assets. Through inspections, we better understand how to control the carbon risks and opportunities in the value chain, which will further help in reduction strategies. In 2015, we took the lead in joining the Carbon Footprint Calculation Platform established by the Taiwanese EPA. 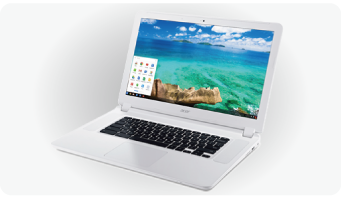 With the cooperation of our major suppliers, we have set out a plan to broaden the carbon footprint inventory across indicator products, completing a carbon footprint report for the Chromebook C740. This cloud-based platform can effectively integrate many parties in the supply chain, providing timely calculation services and greatly reducing operating expenses, as well as accelerating inventory work. 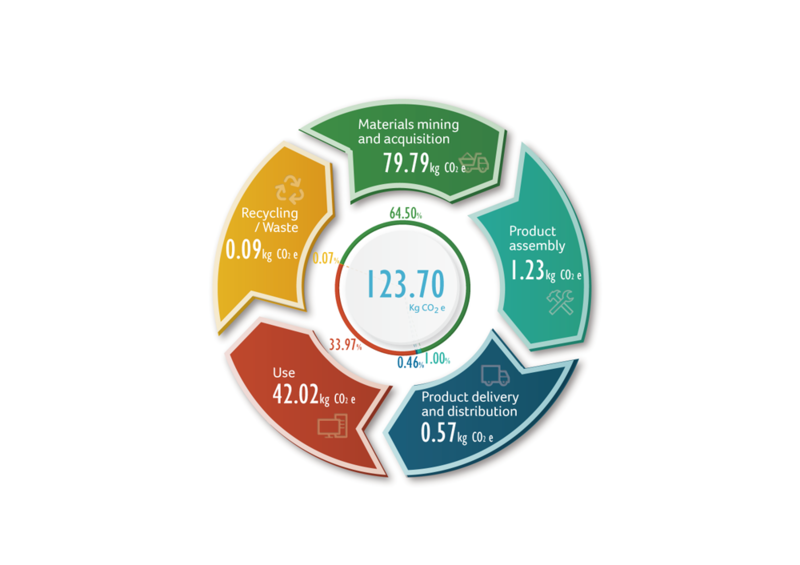 This effort focuses on the office mode of the model, and the results have shown that carbon emissions across the product’s lifecycle total approximately 123.70 kg. The raw materials and the using phases account for greater proportions of that figure, specifically 64.50% and 33.97% of total emissions respectively. The lightweight, quick-booting, quick-connecting nature of the product and the more streamlined components used therein (in comparison with ordinary notebooks) may help reduce the emissions at the raw materials and user ends. According to Acer’s energy and climate strategy, we continue to prioritize energy efficiency at all of our operating locations, with use of green energy the next priority. Where appropriate, we use renewable energy power generation facilities alongside measures such as Renewable Energy Certificates (RECs) and carbon credits to support the development of renewable energy and climate protection plans. In 2017, we have reduced 56.05% compared with the based year also reduced 4.14% compared with 2016. We have also formulated long-term carbon reduction targets in line with the methodology proposed by the Science Based Targeting initiative, and we expect to accomplish in 2050 an 80% reduction in Scope 1 and Scope 2 carbon emissions from the baseline year of 2009. However, by the end of 2017/beginning of 2018, due to the acquisition of listed companies and the disposal of related assets, the Group had already reached a point necessitating recalibration of the base year emission limits, and as such the exact long-term carbon reduction target must be recalculated and confirmed after the said recalibration is complete. In addition to energy saving and the related carbon reduction, Acer is also seeking the opportunity to use renewable energy in Acer's facilities worldwide. Acer's Clean Energy Plan has been decided into 4 steps in different priorities. The first priority of clean energy is to have a green energy initiatives by using renewable energy (RE) in Acer's own facility if the RE condition is available. The second priority is to seek the green electricity in grids and to make advocacy to the governments if there is no green electricity available. The third priority is to seek the suitable regions to build RE facilities worldwide, especially those regions with larger carbon emission by Acer's facilities. The last priority is to procure Renewable Energy Certificates (RECs) or Carbon Credits when the other measures are not available. In terms of green electricity, in 2017 Acer use of renewable energy at its operating locations expanded to include Brazil and Mexico. Usage methods differ by region, with Taiwan setting up its own renewable energy generators, such as solar panels and wind power; the US and Canada going through local Green-e certified Renewable Energy Certificates (RECs), with a particular focus on wind power; and European countries such as Germany and Spain purchasing renewable energy Guarantees of Origin (GOs). In addition, Brazil, Thailand, China, Vietnam, Indonesia and Philippines each make use of local International Renewable Energy Certificates (I-RECs). Acer’s US subsidiary also participates in the EPA Green Power Partnership Program and other renewable energy certifications, leading to 100% of the Company’s electricity coming from wind, solar and other renewable energy sources within the US. According to EPA Green Power Partnership statistics as of the end of 2017, Acer ranks in the top 30 largest renewable energy users of all companies in the ICT sector, known as the Top Tech 30. In 2017, Acer built a solar power plant with a total of four ground and rooftop arrays in the Aspire Park, generating about 3.52 million kWh of electricity each year. And the e-Enabling Data Center (eDC) in Taiwan is the first of our operations to install green energy facilities. The total self-generation amount is about 3.7 million kWh per year. In total, Acer Group uses as much as 21,532.09579 kWh of green electricity certification globally, accounting for 48.07% of Scope 2 power usage. Into the future, we will continue to consider the accessibility, effectiveness, and institutional maturity of green electricity or renewable energy in our operating locations worldwide in an effort to achieve our mid-term goal of a 60% carbon reduction by 2020. Acer has been a member of the CDP program since 2008, and we have encouraged our suppliers to respond to CDP surveys regarding greenhouse gas emissions and policies in response to climate change. This information has then been made public or disclosed to members of the CDP Supply Chain Program. In 2017, we continued to participate in the Carbon Disclosure Supply Chain Program, with Acer’s suppliers achieving an 86% response rate to these surveys and the overall supply chain receiving a C grade for performance. In several key performance indicators, such as Scope 1 and Scope 2 emissions percentages, identification and disclosure of climate risks, and the setting of carbon reduction targets, suppliers actually scored higher than the global average. Target of 2018: Enhance the suppliers' average performance to B. The vendor CSR scorecard continues to address tier one and tier two suppliers' overall carbon management, carbon reduction results, and green energy usage status, amongst other items. These evaluations also include whether or not the group's greenhouse gases inventory and verification has been completed for the year and whether or not the supplier reached its intensity reduction target of 5% and made use of green electricity. Into the medium term, we will be focusing on this as a priority in supply chain management pertaining to production operations, as through this we will be able to boost the overall performance of our supply chain in responding to climate change. The critical suppliers’ carbon reduction goal which is in line with SBT methodology will be included in annual supplier’s CSR scorecard in 2018. In 2017, we continued to cooperate with the CDP China office, particularly with regard to organizing online courses for our China-based suppliers and increasing the capability of those suppliers to respond to climate change and stakeholder concerns. In meetings, we reiterated Acer’s requirements on our supply chain for GHG management and reduction, along with the expanded use of green energy. Acer foundation keeps sponsoring the CDP event twice a year in Taiwan and invites our suppliers to join and learn more updated practices for carbon management and climate issues. In January 2015, the World Resource Institute announced new Scope 2 Accounting Guidance focused on the calculation and disclosure of renewable energy and green electricity in greenhouse gas inventories. This aims to encourage businesses to adopt renewable energy sources as a means to reduce carbon emissions while providing guidelines for the follow-up disclosure thereof. In June 2015, we co-work with the Business Council for Sustainable Development of Taiwan to provide suppliers with free education and training in the new Scope 2 Accounting Guidance and they could get more clear definition of the green electricity and renewable energy also how to take these as key approached to reduce the carbon emission. We have also coordinated these efforts with our vendor CSR scorecard requirements in the hopes of further reducing overall supply chain carbon emissions. In the January 2017 CDP Global Supply Chain Program report, particular note was made of Acer’s concrete achievements in terms of long-term support and cooperation with suppliers to actively manage carbon and incorporate feedback from suppliers.